Sailors and Marines from the Peleliu ESG, including USS Peleliu and USS Germantown, completed the annual amphibious exercise in the Philippines, Oct. 10. 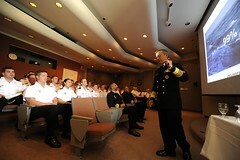 Adm. Harry Harris Jr., commander of U.S. Pacific Fleet, spent time interacting with Royal Canadian Navy leadership and sailors during a visit to Victoria, British Columbia, Oct. 7, emphasizing the significance of the relationship between the two navies as the U.S. rebalances to the Pacific. 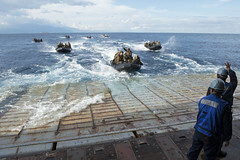 Sailors and Marines from the Armed Forces of the Philippines and Peleliu Expeditionary Strike Group have been conducting a variety of training together during Amphibious Landing Exercise (PHIBLEX). 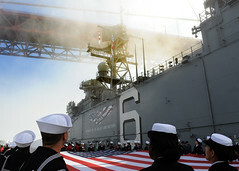 The Navy's newest amphibious assault ship arrived in San Francisco, Oct. 6, in preparation for its commissioning ceremony on Oct. 11 during San Francisco Fleet Week. 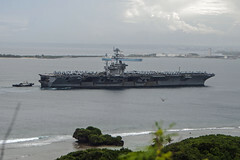 The aircraft carrier arrived in Guam Oct. 2 for a visit in the midst of its ongoing regional patrol, which most recently included exercise Valiant Shield. 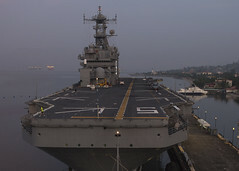 The ships, and embarked staffs and Marines, arrived in Subic Bay ahead of the Philippines-U.S. Amphibious Landing Exercise (PHIBLEX), which began Sept. 29. 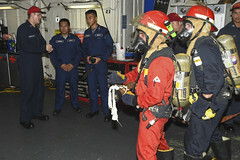 The fourth annual Cooperation Afloat Readiness and Training exercise between the two navies kicked off Sept. 25. 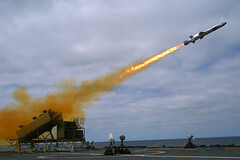 The crew of the littoral combat ship successfully performed a live-fire demonstration of a Kongsberg Naval Strike Missile duringoff the coast of Southern California, Sept. 23. 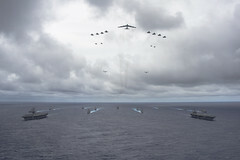 The fifth iteration of Valiant Shield came to a close in Guam Sept. 23 after nine days of joint air, land and sea interoperability training between the Navy, Air Force, Marine Corps and Army. 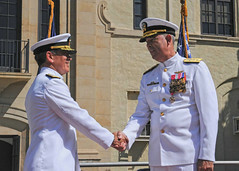 Rear Adm. Russell “Feet” Penniman retired after 35 years in the Navy during a ceremony at Naval Air Station North Island, Sept. 20. This is an official U.S. Navy website. 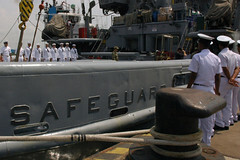 The appearance of hyperlinks does not constitute endorsement by the U.S. Navy of non-U.S. Government sites or the information, products, or services contained therein. Although the U.S. Navy may or may not use these sites as additional distribution channels for Department of Defense information, it does not exercise editorial control over all of the information that you may find at these locations. Such links are provided consistent with the stated purpose of this website.